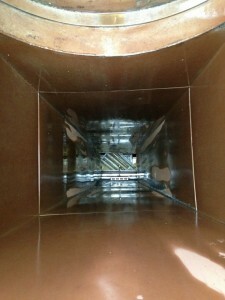 Have you ever seen such a sparkling clean exhaust duct? Maybe your exhaust duct looked this good when your commercial kitchen first opened, but chances are time has taken its toll and now greasy buildup is coating every surface inside your kitchen exhaust system. If you’d like to see your exhaust ducts returned to a clean, like-new condition, just call Flue Steam for a professional kitchen exhaust system steam cleaning. Some contractors try to get away with just doing a cursory cleaning of your ducts. This means that they focus most of their effort on your exhaust hood and the first few feet of ductwork, because this is where you can actually see whether or not they are doing their job. When you hire Flue Steam, on the other hand, you will get an incredibly thorough cleaning of all parts of your system. This is because we use high-quality steam cleaning equipment to reach every nook and cranny of your duct work and effectively remove all that greasy residue. We recommend getting a steam cleaning every 3 to 6 months, depending on what kinds of foods you cook in your kitchen and how quickly grease builds up. 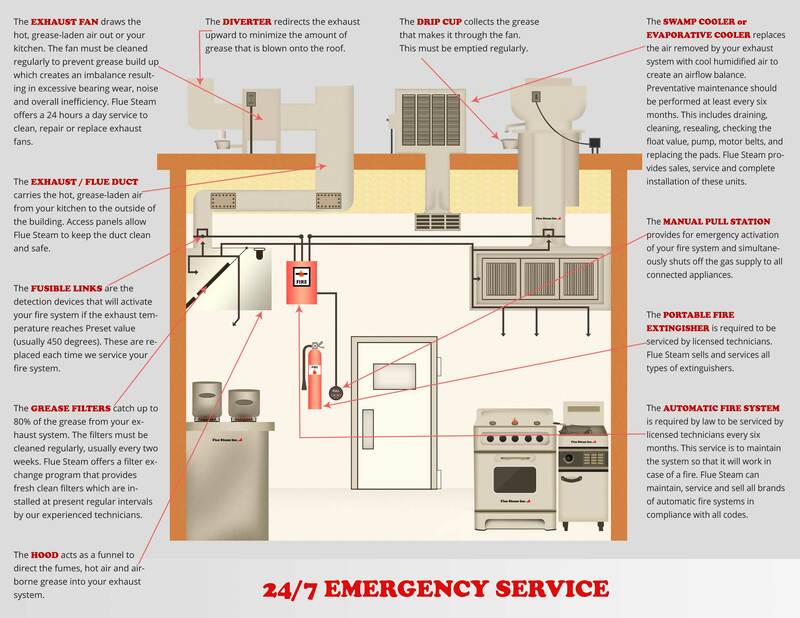 As a licensed exhaust system cleaning contractor, Flue Steam can help you comply with all that red tape related to your fire safety code obligations. We can provide convenient “Certificate of Performance” stickers with the date of service on them, so that after each job you will have proof that you have compiled with your exhaust system cleaning responsibilities. Both code inspectors and insurance agents will be happy to see our stickers because they indicate that your kitchen is cleaner and safer. Besides the fact that we deliver sparkling clean ducts, you will enjoy working with Flue Steam because we are true experts in every aspect of kitchen air control and fire suppression. During your cleaning appointment, we will also inspect your exhaust fan for wear and tear and offer to make any necessary repairs.